When it comes to the two films it's not necessarily about Rogue One vs The Force Awakens. But thankfully YouTube channel Lessons from the Screenplay ponders this question nonetheless in a new video essay titled 'The Fault in our Star Wars', which looks at what each film got right—and what it got wrong. Addressing the Rogue One Vs The Force Awakens question Lessons from the Screenplay (aka Michael Tucker) does this in a fascinating way by looking at classic screenwriting techniques, and applying them to each movie. Using this approach the video reveals how each film differs in the way the characters interact with one another and in this dynamic, how they move the narrative onwards and create meaning. For instance the two female protagonists. In Rogue One Jyn is revealed as being swept up in the events without much say. From having her family torn apart when she was younger, to then finding herself busted out of Imperial prison and being involved with the Rebel Alliance. Rey on the other hand has a much more sedate life on Jakku, and then when the opportunity arises for her to get involved in the action, she takes it up and the decisions she makes change her entire life. In this sense, the characters in Rogue One had actions act upon them, rather than be in control—Jyn was a passive protagonist instead of an active one. And Lessons from the Screenplay thinks that in the battle of Rogue One Vs The Force Awakens, the latter with its active protagonist, makes for a more fulfilling movie. That's not to say Lessons from the Screenplay is dissing on Rogue One, Tucker makes clear that he's a huge fan of Star Wars movies in general. But in order to be a fan of the franchise, he thinks it's also important to approach them critically, looking at both films' flaws as well as their successes. In Rogue One Jyn's backstory makes for a confusing start, telling rather than showing, but leads to a really gripping climax. While The Force Awakens treads over ground we've seen before, recycling to the point of deja vu. But with its showing rather than telling when it comes to Rey's life on Jakku, it pays off. Because by the time we see her unable to sell BB-8, we totally emphasise with her. We're sold on her as a character. "Being shown this sequence allows us to experience this with her which lets us understand her life much better than just being told about it." notes Tucker. And not only does that make for engaging filmmaking, but ultimately more meaningful consequences and actions later on, and leads to characters we care more about. 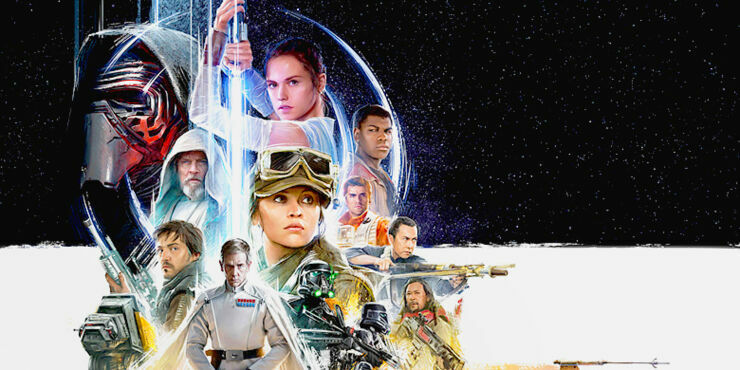 "While The Force Awakens may have bitten off a bit more than it could chew," concludes Lessons from the Screenplay, "Introducing new characters, continuing original trilogy storylines, establishing a new planet killer weapon only to destroy it shortly after—I feel it does do a fantastic job of making the audience invest in the protagonists. We understand who they are, and see them work together to overcome obstacles and share emotional losses. Making us eager to see what lays waiting for them in Episode VIII." 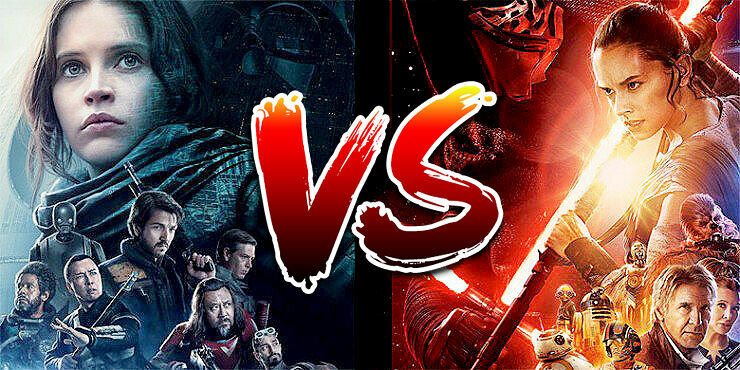 So Rogue One vs The Force Awakens isn't really a competition we can judge. Check out more of Lessons from the Screenplay on their YouTube channel or follow Lessons from the Screenplay on Twitter.